I'm SO excited for today's post! 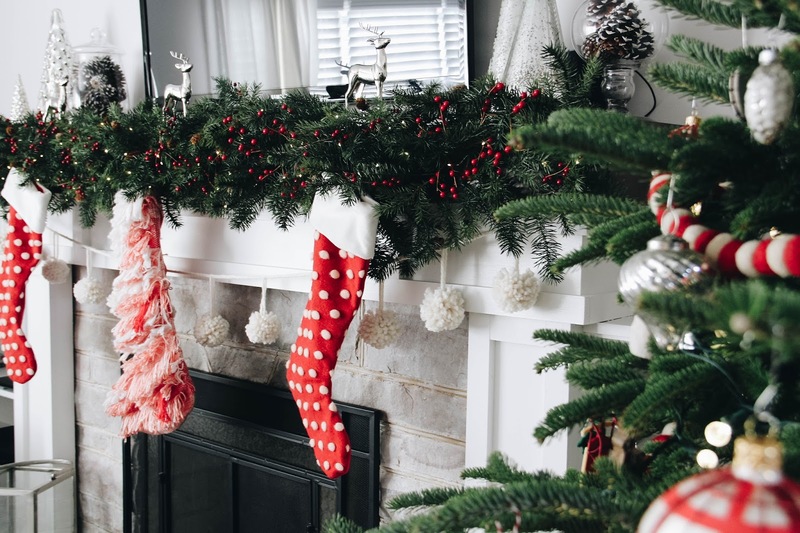 I've been toying around with my Christmas mantle for weeks now. Nothing I did was coming out like I was hoping. Not. A. Single. Thing. 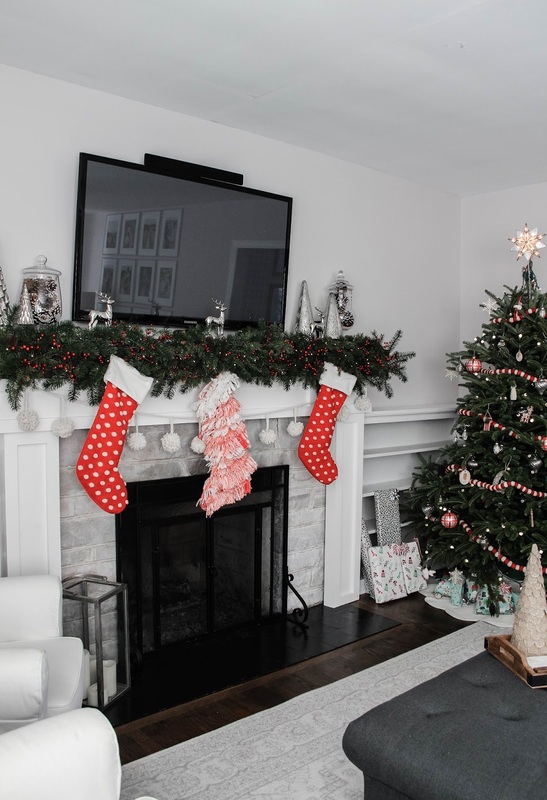 I went from garland that hung down the sides of the fireplace, to a thicker strand just across the top. I added red berries to give it a fuller look and to better accent the Christmas tree. 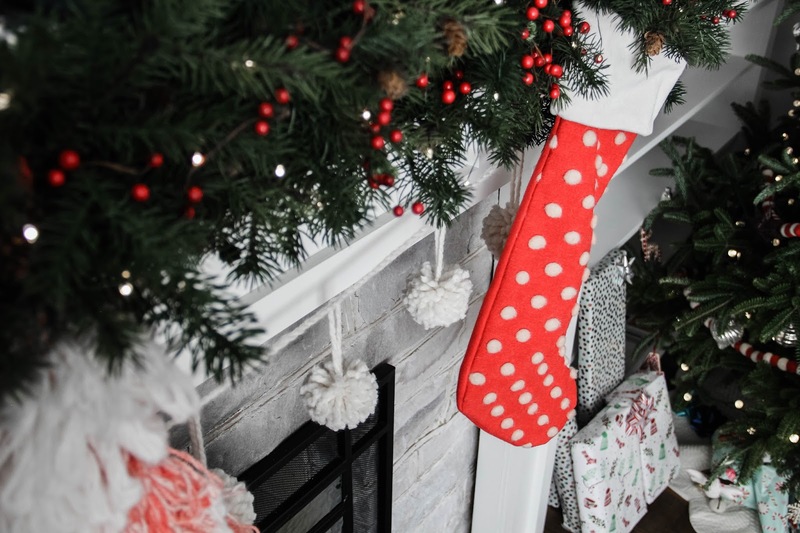 I found different stockings that fit more of what style I was trying to achieve. But, still, something wasn't right. 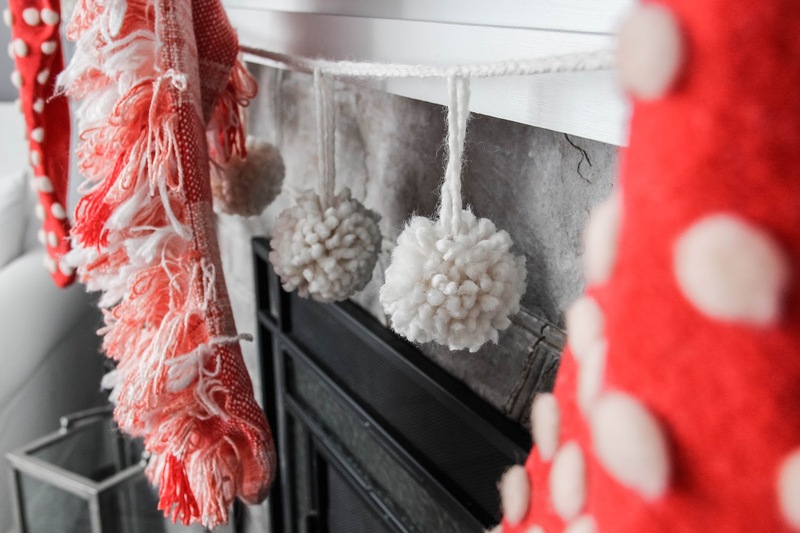 Then my friend, Jessica, shared her post from a couple of years ago for DIY pom garland. I was immediately inspired to make my own with hopes of getting just the look I was hoping for. And y'all, all the praise hands because my mantle is now exactly like I wanted it! 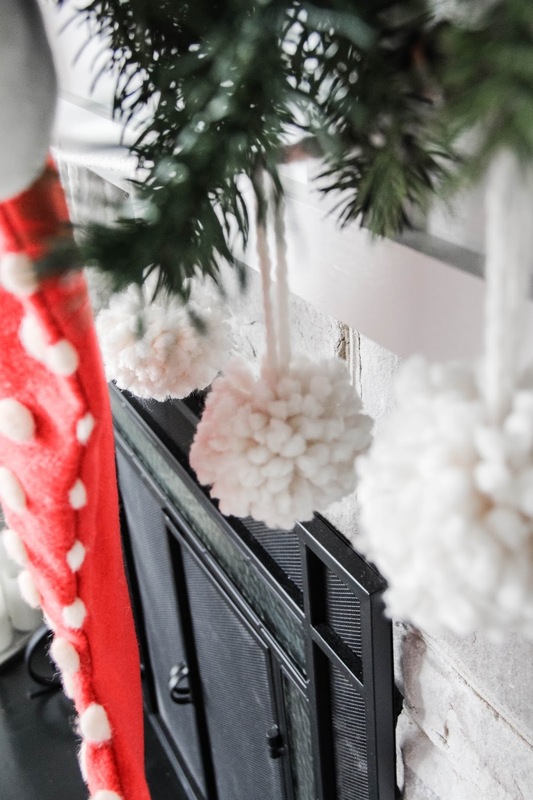 You can make this pom pom garland too. It's incredibly simple, requires few supplies, takes little money, and looks amazing/like you spent a pretty penny on it. So earlier this week Greer and I headed to Michaels to get the yarn I needed. You're looking for a thick and neutral-colored yarn. You could always go with a colored yarn if that's more your flair. I went with neutral for a few reasons: 1. That's more my style. 2. 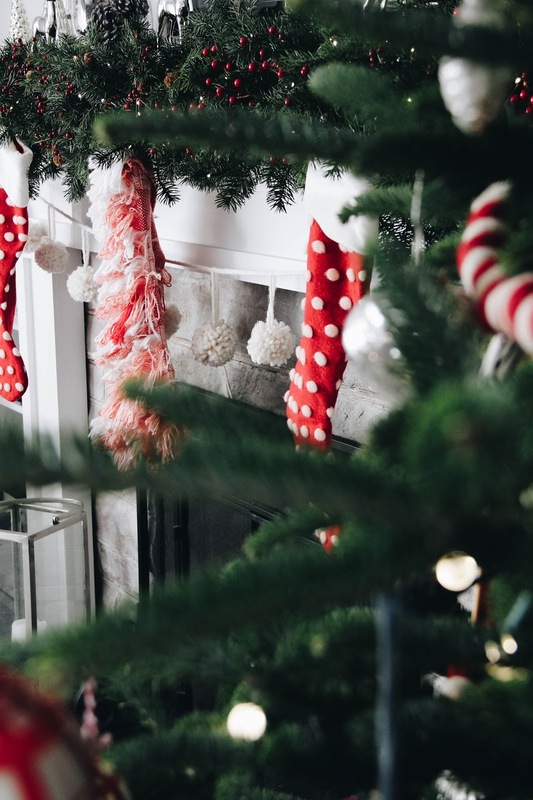 I want to be able to use this garland for several holidays and throughout the month of January. The yarn I selected is linked at the bottom of the post. 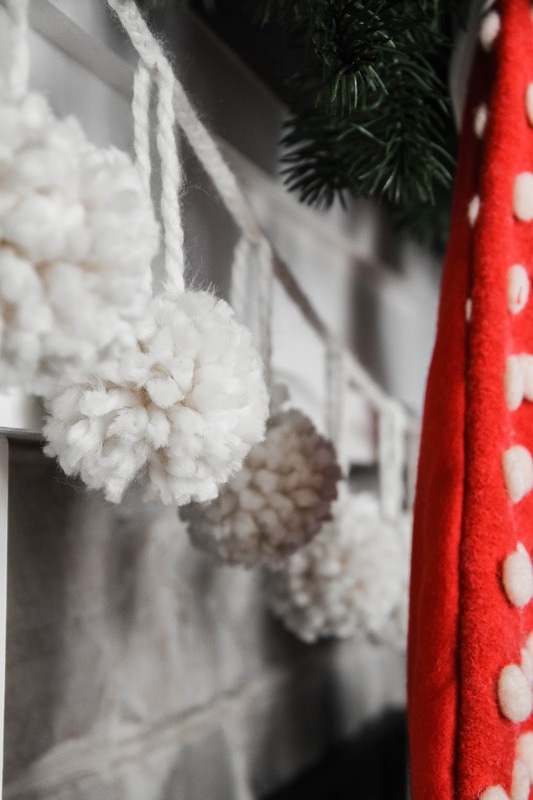 Set aside some time time to make the pom poms, maybe during your little's nap time or after they've gone to bed. Be sure to have a good show or movie on to entertain you while you craft. A cup of iced coffee never hurt either ;) The tutorial is below! My husband drilled holes (spaced 0.5" apart) into a 2x4 piece of wood. You can use two dowel rods, spacing them for your desired size pom. Mine are spaced three inches apart. A paper clip stapled into the top of the wood acts as a way to secure the start piece of the yarn. You want to keep about 6-7 inches of yarn free of the pom. This will act as the way to hang the pom. Wind the yarn around the dowel rods 35 times. One full circle = 1 time. Once you get 35 times around, take the extra yarn and tuck it into the paper clip. And cut the excess off. Cut a 6 inch piece of yarn and slip it underneath the wound yarn at the middle. 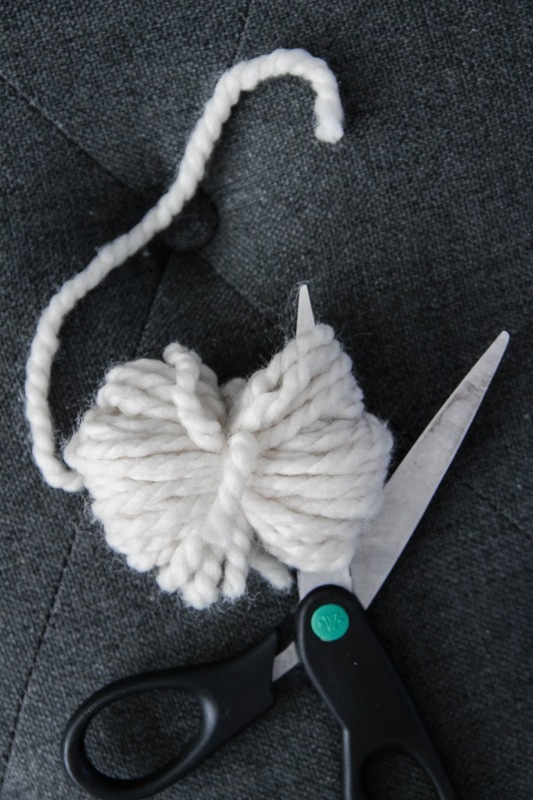 Tie it tightly and make a knot, creating two halves of your wound yarn. Trim the excess piece of yarn to the length of half the wound yarn. Pull the yarn off the dowels. One side at a time, use scissors to cut the loops (see photo below for reference). Now you will "trim" the yarn around the edges. This will fluff the pom up a lot and make it shape-up into a perfectly round ball. Make sure all pieces of yarn are the same length. 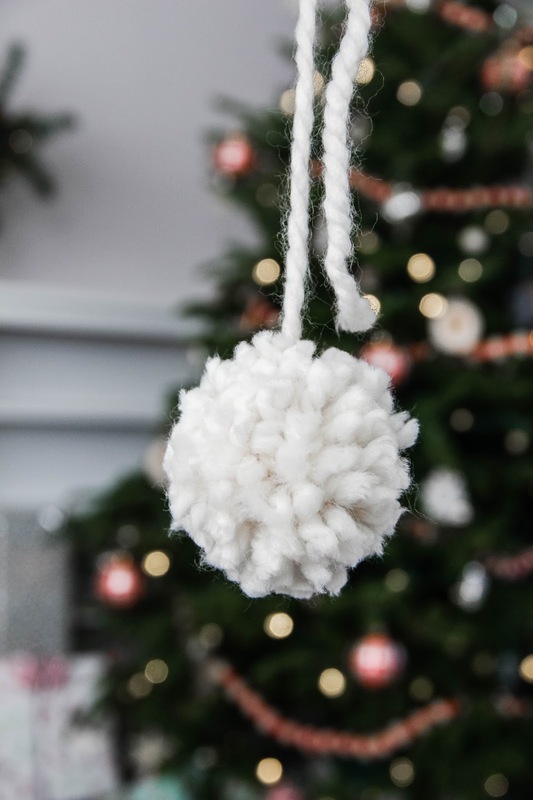 Be sure not to cut the long piece of yarn that will be used for hanging the pom. 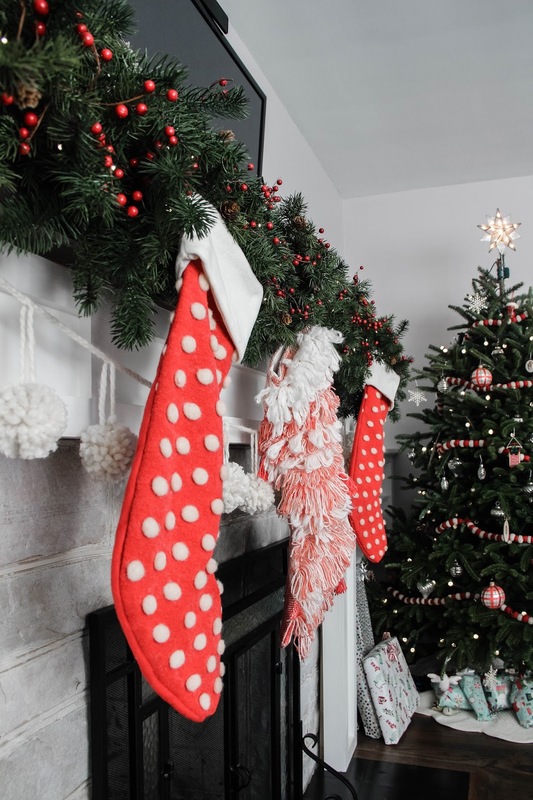 Next, measure the length of the space you'll be hanging the garland. Adding about six extra inches, cut three pieces of yarn to that length. Lay them evenly together and tie one end into a knot, connecting the three pieces of yarn. Braid the yarn and tie a knot once you get to the end. 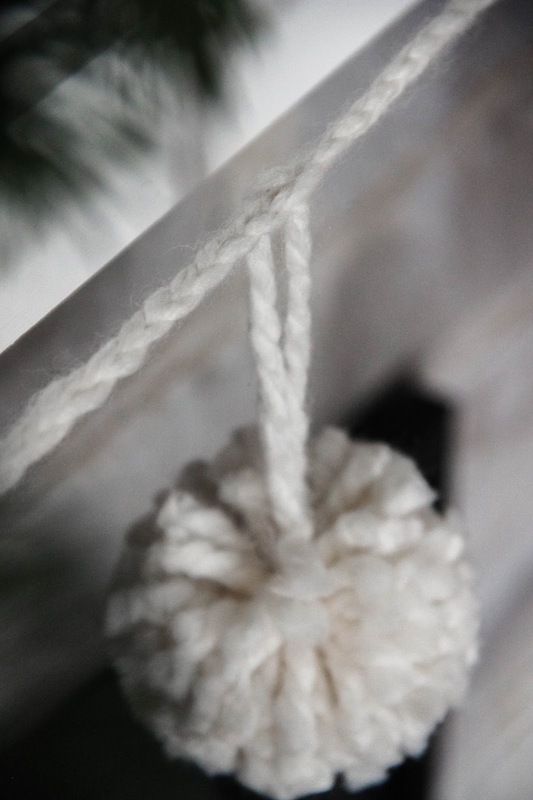 To hang the poms, gently pull a part of the braid "up" or apart. 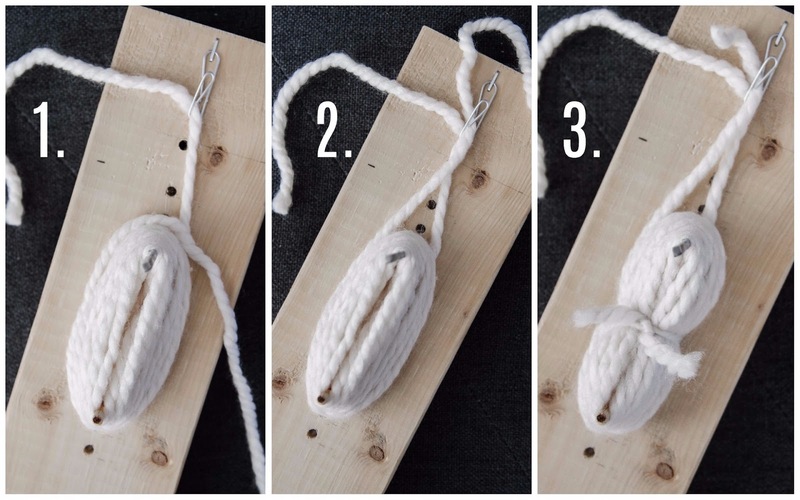 Pull the extra long piece of "hanging" yarn on the pom through the open part of the braid. Hang it even, then tie it to the other end of itself, making a knot. Fluff the ball up if you need to hide the knot. It conceals super easily. Repeat this pattern until all of your poms are hung. **Space the poms evenly. You can hang as many or as little as you want. For mine, I used 12 poms. **The weight of the poms will create the sagging effect. You make have to shorten the long, braided piece to get the desired swag. I found that hanging the braided piece and adding the poms one-at-a-time was helpful for figuring out spacing and swag. **You can change the size of your poms simply by adjusting the spacing between the dowels. For small poms, space them closer together, and you won't have to wrap the yarn 35 times around, but less instead. Vice versa for bigger poms.